Wallis was commissioned lieutenant on 31 March 1779 and became the first lieutenant of the Boreas 28, Captain Horatio Nelson, in May 1784, in which role he was praised for thwarting attempts by disaffected merchants to serve writs upon his commander in a dispute over the Navigation Laws in the Leeward Islands during May 1785. He assumed the acting command of the Rattler 16 in the Leeward Islands following the death of Commander Wilfred Collingwood in April 1787, returning with her to England and paying her off in October. Wallis was eventually promoted commander on 20 January 1794, and he took the Gorgon 44 to Gibraltar from Corsica in Vice-Admiral Phillip Cosby’s convoy which included the massive French prize Commerce de Marseilles 120, going aground off Cadiz but getting off safely. In September she sailed for home under the orders of Commodore Hon. John Rodney. The Gorgon was paid off in March 1795 after convoy duty in home waters, and in September 1796 he recommissioned the fireship Tisiphone 8, serving in the North Sea until posted captain on 4 May 1797, whereupon he left his command at Sheerness. 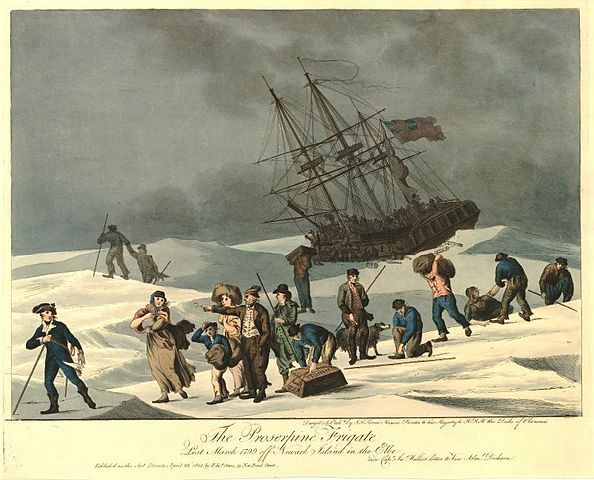 By the early part of the following year he was commanding the frigate Proserpine 28 in home waters, but during a storm on 1 February 1799 she became ensnared by ice on the Scharhörn Reef in the mouth of the River Elbe off Cuxhaven, and although he got his crew ashore fourteen men subsequently perished in the bitter winter conditions. The Proserpine had been carrying the Right. Hon. Thomas Grenville and his staff on a diplomatic mission to the Prussian court in Berlin, and but for the politician’s insistence Wallis would never have gone to sea in the first place. He was acquitted of blame for the loss of his ship at the subsequent court-martial. In June 1799 he commissioned the recently captured French frigate Decade 36 and took her out to Jamaica in January 1800 where he exchanged into the Brunswick 74 that summer, bringing her home to pay her off in September. 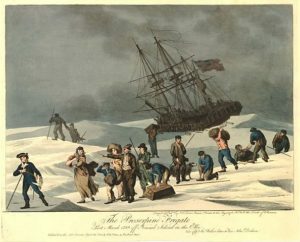 Thereafter Wallis remained unemployed for upwards of a year until he set out from Salisbury for Plymouth in November 1801 to assume the command of the Achilles 74 in an acting capacity for Captain Edward Buller, that officer preferring not to go to the West Indies, to which station his ship had been ordered. Two weeks into Wallis’ tenure the ship was pestered by bum boats in Cawsand Bay, and to warn off one persistent offender a lieutenant, John Mudge, discharged what he had been told was an unloaded musket and shot the boatman in the face, fatally wounding him. Mudge was charged with manslaughter and found guilty, The Achilles then joined Vice-Admiral Sir Andrew Mitchell’s squadron at Bantry Bay in order to rendezvous before the passage out to the West Indies, but in the event her orders were countermanded and Captain Buller returned to her command in January 1802. Within a matter of weeks Wallis was placed in command of the Fisgard 38 at Plymouth, engaged in the preventative service, transporting marines to Portsmouth, and then discharged sailors to Ireland. On 9 September he and his crew transferred to the Naiad 38 which had been re-commissioned to replace the paid-off Fisgard, that vessel requiring a great deal off repair. The Naiad then remained at anchor for much of the next few months in Cawsand Bay whilst the country enjoyed the brief peace. On the resumption of hostilities in May 1803 the Naiad sailed for Brest, and she was soon busily engaged cutting out a brig and a chasse-marée near the Penmarks. On 29 May she took the French corvette Impatiente 10 in the Bay of Biscay, and on the night of 4 July her boats cut the schooner Providence 2, with twenty-eight heavy guns on board, out of the Ile de Seins off Brest. Within the next week she captured a French merchantman, and she then joined the Doris 36, Captain Richard Harrison Pearson, in the hunt of a Dutch sloop, a French corvette and two French brigs. During September and October she underwent a refit at Plymouth before sailing out to join Commodore Sir Edward Pellew off Galicia, and she returned to Plymouth via the Channel fleet in January 1804. In the early part of 1804 Wallis was reported as dangerously ill of fever at his house in Stonehouse, Plymouth, and in October he was succeeded on the Naiad by Captain Thomas Dundas, whereupon he retired due to his persistent ill-health. He did not see any further service and died in early 1808. Wallis apparently had strange ways, and it was stated, somewhat curiously, that he could threaten to hang a warrant officer whilst using general conversation and taking snuff. He was nevertheless a kindly officer, a good seaman, and was very well regarded by his men.